Expected to lead the team, outstanding receiver Bill Steiger was partially paralyzed in an auto accident a few weeks prior to the opening of fall camp and this may have had a galvanizing effect on the squad. He later made a progressive and full recovery but at the time, the team was devastated yet motivated by the loss of their All American end. Soph Gail Cogdill filled in admirably while Jack Fanning excelled, pulling in a record three TD catches vs. Nebraska, and nine for the season. A last gasp 21-18 victory over Stanford, was “neutralized” in “The Goal Post Game,” a 14-13 loss to Oregon that saw the tie-making extra point bounce off the goal post. The Rose Bowl was still in sight but two losses late in the season scuttled that dream though a win over Washington was well celebrated as was the 6-4 record. 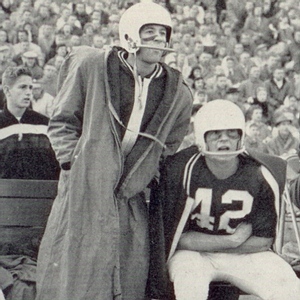 Though he missed battery mate Steiger, QB Bob Newman finished second in the nation in passing and end Don Ellingsen who doubled as an excellent pole vaulter, ranked third in receptions with forty-five. Tough Chuck Morrell handled the rushing game adequately. Sutherland changed the look of the WSU uniforms by removing the player identification numerals from the sides of the white helmet. In 1956 major penalties were levied against Washington, UCLA, and USC in a “slush fund” scandal, and every other school in the Pacific Coast Conference was fined or penalized except for Washington State. By 1958, the conference was essentially dissolved amid the ongoing scandal with USC, UCLA, and Washington ineligible for the Rose Bowl and many players banned for the year. 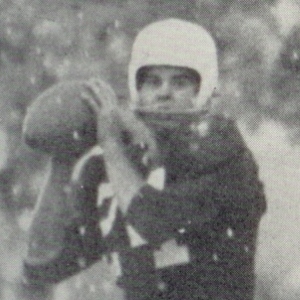 For the ’58 season, Coach Sutherland restored the crimson three-inch player identification numerals to both sides of the white Riddell and Wilson helmets favored by the squad, with most of the team using white plastic Wilson one and two bar face masks. With end Bill Steiger recovered from his paralyzing injury, big things were expected and the 7-3 record kept the Cougars in the Rose Bowl race until the final game. Despite losing QB Bob Newman to a knee injury mid-way through the season and his backup Dave Wilson shortly thereafter, DB Geoff Price, brother of future WSU head coach Mike Price, filled in quite well. Against Northwestern in what would be Ara Parseghian’s first victory there, end Cogdill set a long standing NCAA record with seven receptions for a whopping 252 yards. End Don Ellingsen again was effective and 165 pound guard Bill Berry used his wrestling skills to show All Coast Team ability. The running attack demonstrated promise with sophomore Keith Lincoln and veteran Chuck Morrell. When Morrell was called upon to run he often excelled, finishing second to CAL’s Joe Kapp in conference total rushing. He would on occasion suddenly fall down without being touched by an opponent and it was many years later that it was discovered that he had inherited a disease that limited his heart output. Despite this he doubled well as a linebacker and DB. Morrell was in camp with the Redskins but was cut with Tom Flores and Bobby Beathard. His work in the WSU theater department turned into a career in both acting and producing. CAL’s victory over Stanford in their season’s finale bumped the Cougars out of the Rose Bowl. The squad was invited to bring their exciting passing game to the Sugar Bowl game but despite the break up of the PCC, the school administration forbade a violation of the exclusive Rose Bowl agreement the conference had. “Suds” now had a national reputation as a passing game genius. On June 30, 1959, the Pacific Coast Conference was officially disbanded and through 1961 WSU would play as an Independent. Even without facing off against USC and UCLA the slate was rugged, included two games against Oregon, and was ultimately disappointing with a 6-4 finish. Lincoln rushed for 670 yards behind big Ron Green up front but the pass of course was the mainstay and Cogdill completed his fine career and then won NFL Rookie Of The Year honors with the Detroit Lions. The all time Lions reception leader and three-time Pro Bowl performer by the time he left them for the Colts during the 1968 season, Cogdill became the first Cougar to appear in a Super Bowl Game. He finished his pro career in Atlanta in 1970. Astute WSU uniform fans noted that almost all of the players had switched to the white Adams plastic face masks.